As Senior Advisor, Gabriel specializes in the public sector, financial & budgetary management, policy, operations and strategic planning. With over 30 years of experience in the public sector and not-for-profit sector, Gabriel has held increasingly senior positions including Associate Deputy Minister of Finance responsible for fiscal planning; Assistant Deputy Minister of Education responsible for all aspects of education funding; and CEO of the Institute of Public Administration of Canada. 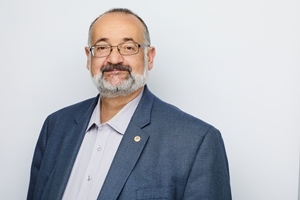 Gabriel Sékaly’s public service career has spanned almost 30 years and included work in eight different provincial ministries. Gabriel’s extensive experience with the education sector comes from both serving as an Adjunct Professor at Queens University’s School of Policy Studies, as well as serving as the Assistant Deputy Minister of Education, overseeing the Financial Policy and Business Division, between August 2010 and February 2017. In that role, Gabriel was responsible for the development and implementation of ministry policy for funding the operations and capital requirements of Ontario’s 72 school boards. He was also responsible for the operational review of school boards and for supporting the Ontario Government’s responsibilities with respect to the Ontario Teachers’ Pension Plan. Additionally, Gabriel played a pivotal role in various rounds of collective bargaining with the education sector unions. Gabriel Sékaly’s public service career has spanned almost 30 years and included work in eight different ministries. Gabriel specializes in the public sector, financial & budgetary management, policy, operations and strategic planning. Gabriel previously served as Assistant Deputy Minister of Education, overseeing the Financial Policy and Business Division, between August 2010 and February 2017. In that role, Gabriel was responsible for the development and implementation of ministry policy for funding the operations and capital requirements of Ontario’s 72 school boards. Prior to that, Gabriel also served as the Associate Deputy Minister of Finance with the Province of Ontario, Gabriel provided the Minister of Finance and the Government with advice and assistance on all aspects of fiscal and financial policy, fiscal planning, expenditure management and reporting, and overall stewardship of the financial resources of the province. Before being appointed ADM at the Ministry of Education, Gabriel was the Chief Executive Officer of the Institute of Public Administration of Canada (IPAC), between August 2006 and July 2010, during which time he modernized the organization.